I should say right away that real lamingtons don't look like these - they're cubes of sponge cake, sometimes with jam in the middle, coated in chocolate and sprinkled with coconut. Like this. 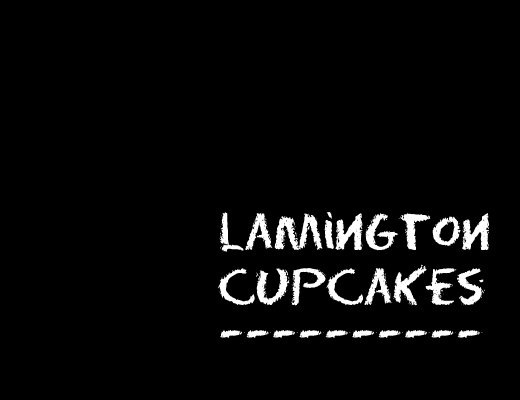 * According to wikipedia, they're named for the 2nd Baron Lamington, Charles Cochrane-Baillie, who was Governor of Queensland from 1896-1901, and whose household at some point invented them, impromptu, at the very last minute before social disaster. Apparently Lord Lamington (who is famous for shooting a koala on his way home from meeting with conservationists about establishing a national park) hated them. * Please read the accompanying article. It's like an Australian version of The Onion, only it's real. I wanted to make lamingtons for the Australia Day party I held in January, but I had no intention of forming precious cubes and dipping one side and then the other, etc etc. 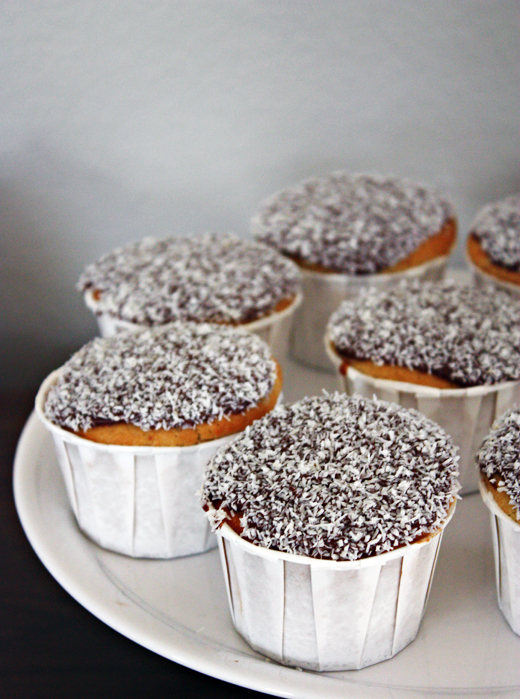 Making cupcake versions is a brilliant idea (not mine; I stole it from the fabulous blog, Boyfriendly Cooking). I'm not sure that any of my American friends knew they were eating a little piece of Australian culinary history, but they seemed to like them anyway (especially the kids present, who helped me ice them, and who I may employ in that capacity for every cupcake I make from now on). Heat oven to 350F. Whisk flour, baking powder, salt and coconut together. In a second bowl, cream the butter and sugar until light and fluffy. Add eggs one at a time. Beat in vanilla. Add flour mixture and milk alternately. Scrape the bowl and sides to make sure everything is mixed. Fill muffin papers about 2/3 full. Bake for 20 minutes. Transfer to a wire rack to cool. To make chocolate icing: sift icing sugar and cocoa and mix together. Add hot water a teaspoonful at a time, or less, until you have the consistency you want. You don't want this icing to be too runny. When cupcakes have cooled, spread the chocolate icing on the top and then dunk the cupcake top into a bowl of dessicated coconut. Repeat. So have u tried this recipe in the party? Oh dear, how did you find that article?!?!!! I just found your blog and I LOVE your photos! Definitely looking through all your food to try out some new things! These desserts look great. Thanks for sharing it. I love this cupcake version! I hate coconut on/in my sweets (I come from a place where coconut is more of a savoury ingredient in dishes comme ca (http://cheekychilli.wordpress.com/2009/05/26/a-delectable-pink/) but even so I have to say those photos are so delicious that I could be tempted to sink my teeth into these gorgeous treats. What fabulous photos and a beautiful blog! I'm supposed to be viewing your latest post but then my husband was ogling at these so here I am! He's begging me to make the recipe right now. I made these and they are DELICIOUS! 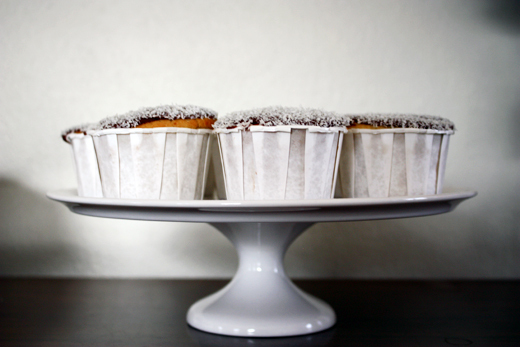 But where did you get the adorable little baking cups? ?